Here’s everything you need to know about the hop-on, hop-off double-decker Habana Bus touring Havana City. Where the bus leaves from, where it goes, where it stops, bus timetable, Habana bus map and what you see along the way. 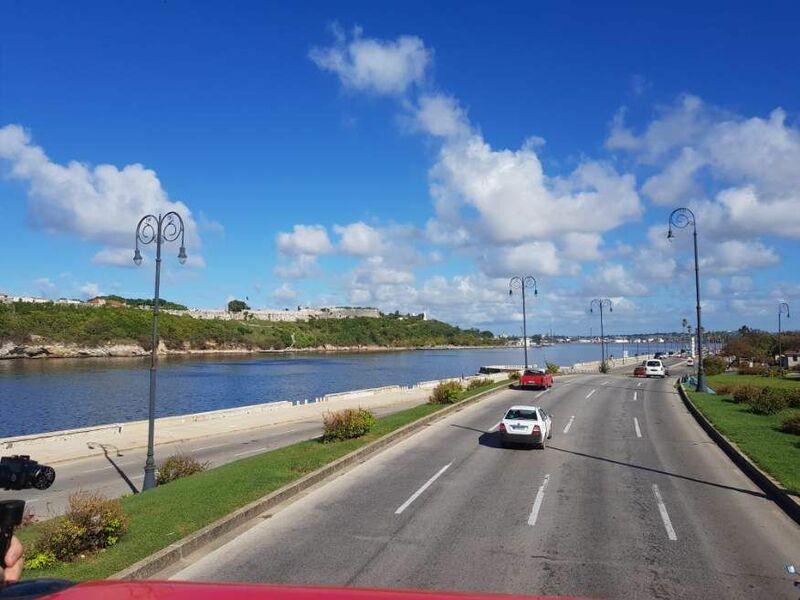 Enjoy fantastic views on top of the Habana Bus. The Habana Bus tour is not a dedicated city tour of Havana. It does however, have a guide on board offering a commentary on the sights along the way. But the street noise and limited audio make it hard to hear what they are saying. 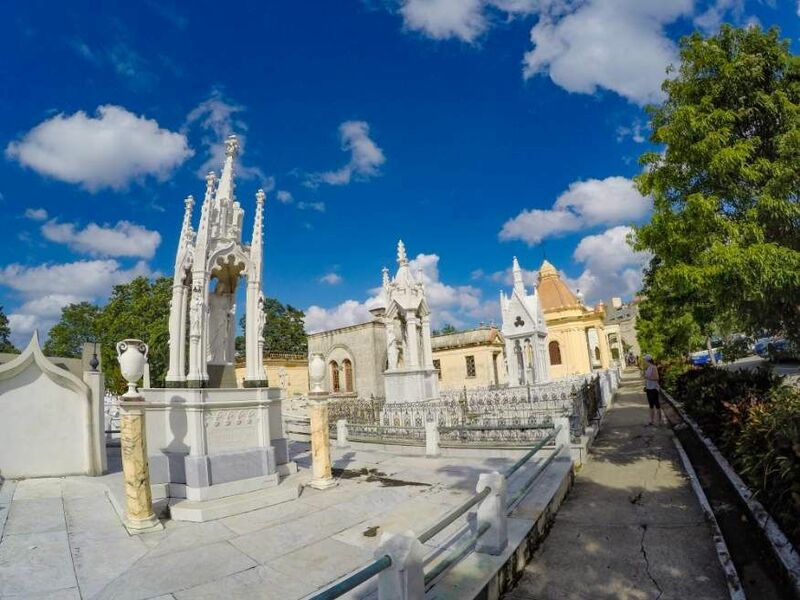 The Havana Bus Tour is a cheap way to take in the sights of Havana city which you just couldn’t walk to in one day. The tour drives through many interesting and different areas of Havana. You can get off at any of the designated stops, explore the area on foot, then catch the bus again to move on and visit another area. 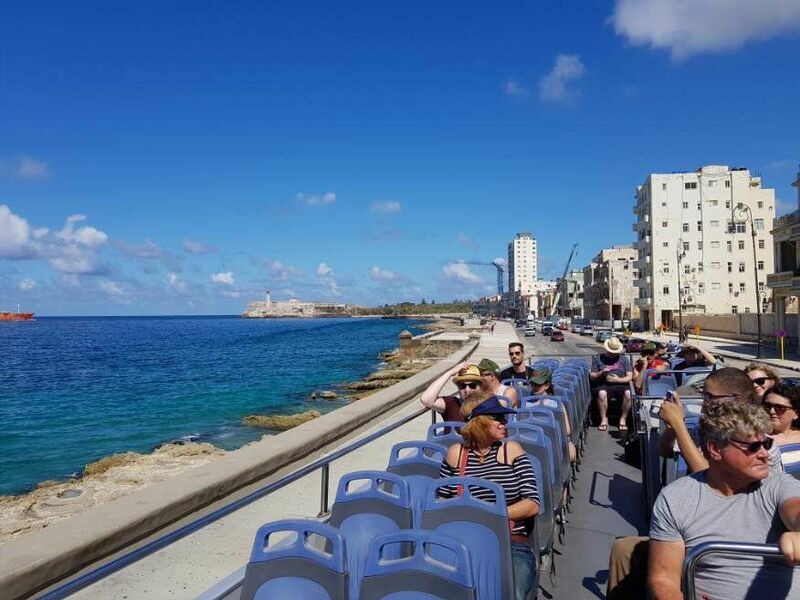 The upper deck offers a great vantage point for panoramic views as you go through Havana and take pictures.just be aware of the sun and apply plenty of sun screen. If you haven’t yet arrived in Havana to go on the Habana Bus Tour, take a little time to read our Airport Transfers Guide to get you to your hotel safely. Wed seen these open topped double decker buses around Havana, they look really cool so we decided to give it a go. Although you can start at any of the many stops we got on at the beginning from Parque Central. The bus is really easy to find, its usually sitting there waiting to go, if its not, just look for the blue sign with the map and timetable. The bus stop at Parque Central is opposite the Hotel Inglaterra and Hotel Central Park. 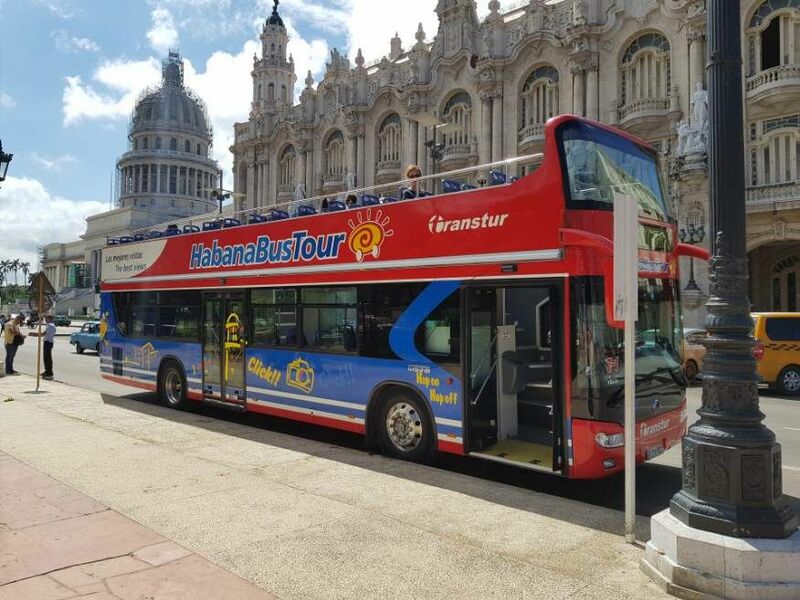 There are two different tours called “Habana Bus Tour” that leave from Parque Central. One is this one “T1”, which is the open topped double decker. The other one “T3”, which leaves just a few meters in front in a regular size bus, goes out to Playas Del Este Beach. There is no T2 tour now. The hop on hop off Habana Buses run every 30 mins starting at 9am everyday with the last bus leaving at 6.10pm. 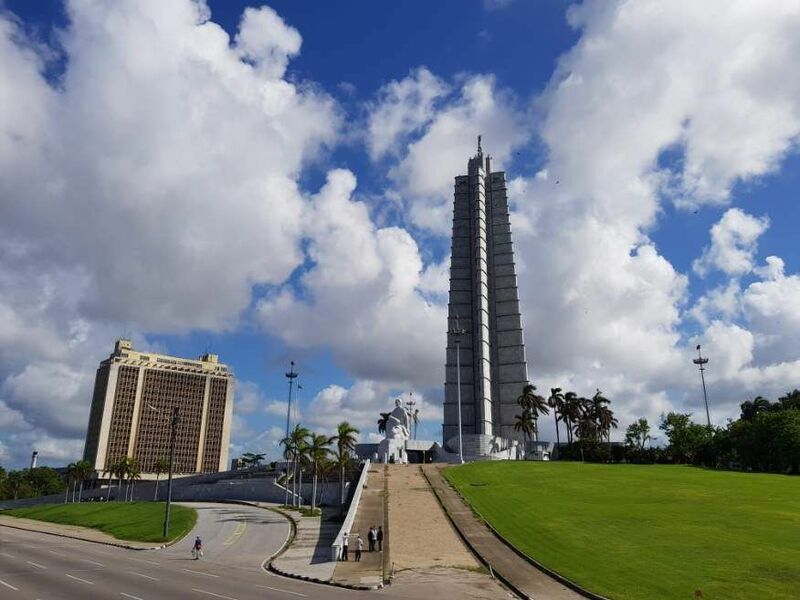 The bus tour continually circulates past most of the popular attractions in and around Havana, its super convenient and surprisingly good value. This tour used to be two separate tours T1 and T2, but has since been combined into one called T1. You’ll see all the stops marked on the Google Map at the bottom of this page. 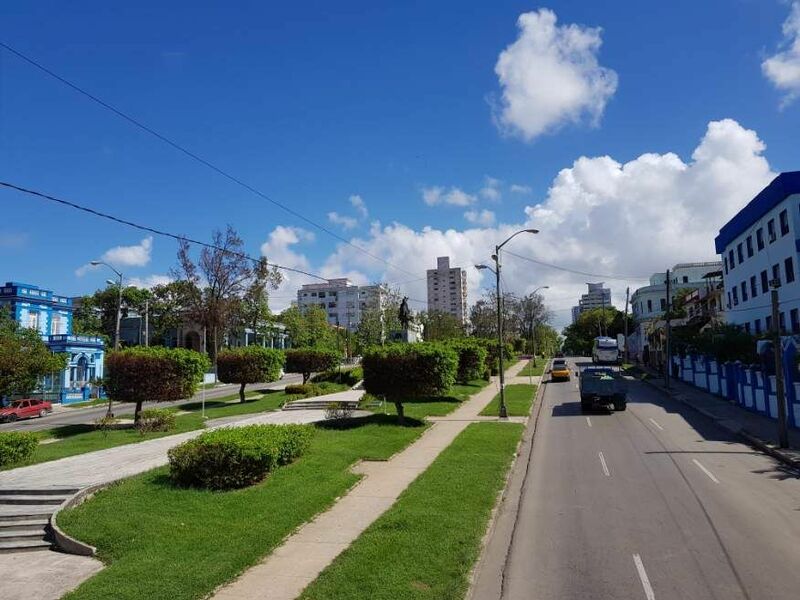 Select Habana Bus Tour – Havana City for this route. One point worth noting is that for obvious reasons tour buses cannot enter the ‘Old Havana‘ part of town, because of traffic restrictions, which will still need to be discovered by foot. 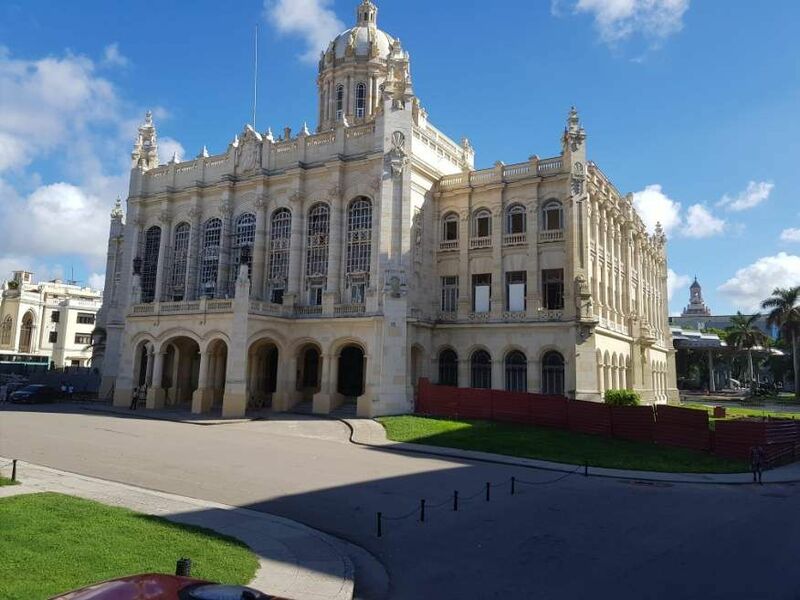 Capitol and Gran Teatro de La Habana – pay the $2CUC for a tour of the Grand Theatre & Palace. The Capitol is still closed but worth a walk around. 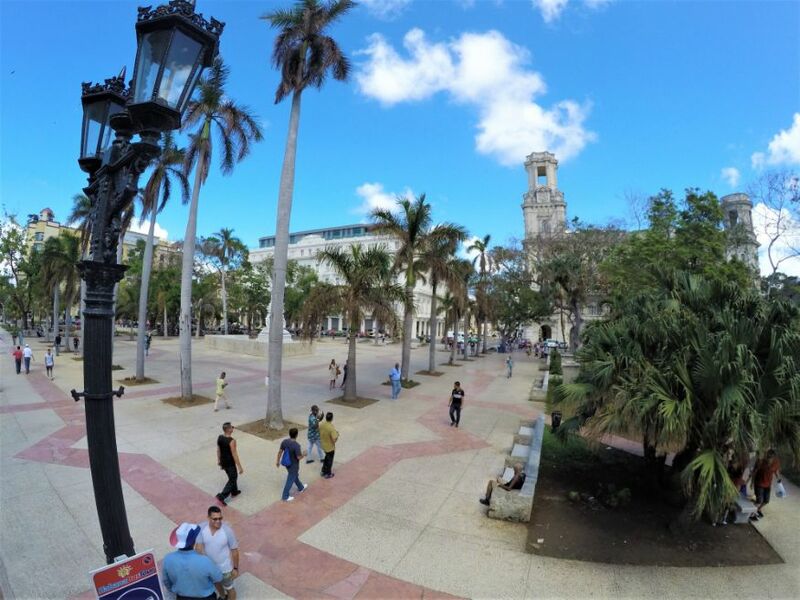 Castillo de la Real Fuerza – visit the Plaza the Armas, Cathedral square and the Plaza Vieja in Old Havana here. While the Habana Bus Tour stops at some profilic hotels, try reviewing our Lodging Guide for more affordable options. Havana Bus Tour route T1 goes around Old Havana, with stops along the Avenida del Puerto. You can get off at the Castillo de la Fuerza. 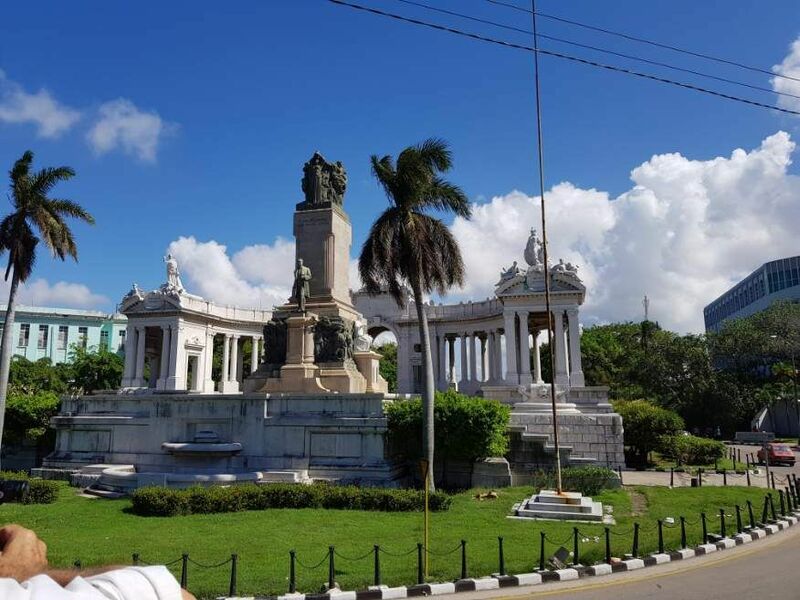 On the west side of Old Havana, the T1 route goes to Parque Central and the Capitolio, great if you are staying in any of the many hotels in the area. Then along the Malecon taking in excellent views of both El Morro and La Cabana forts. 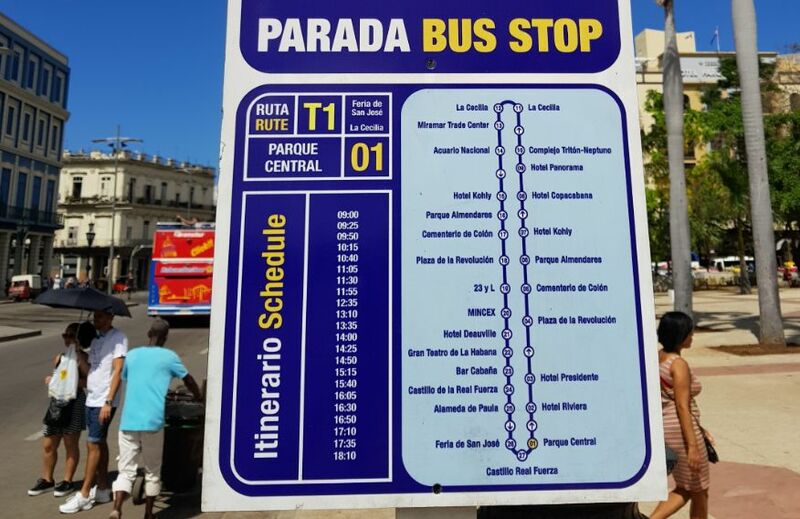 The Havana Bus Tour route T1 then goes to Vedado and onto Revolution Square. After Revolution Square you can get off at the Cohiba Hotel, the Colon Cemetery. 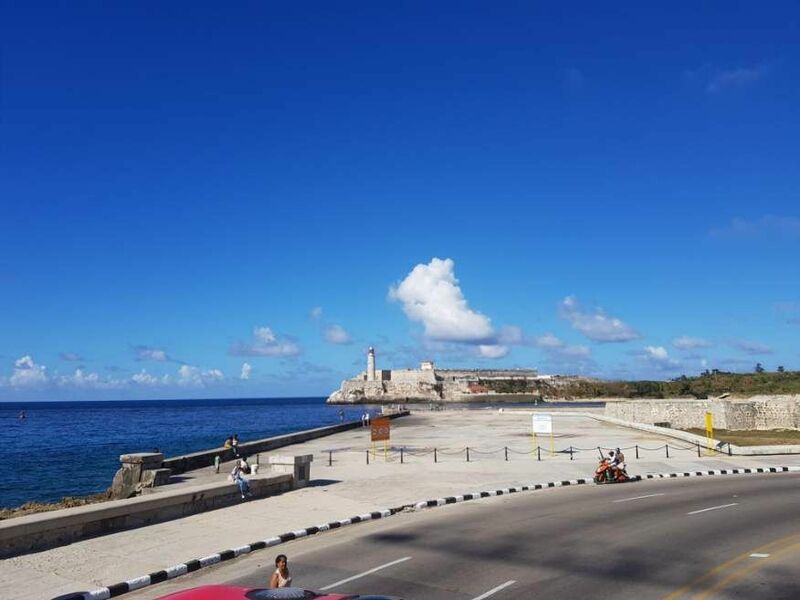 It then crosses over the Almendares river to Miramar, with stops at the City Scale Model (Maqueta de la Habana), the Aquarium, restaurants and shops, to the final stop at Marina Hemingway. You can get off and walk around for as long as you want at any of these stops before getting on again. At only $10 CUC per person it’s a great tour. You pay the guide who stands just inside the bus, in cash only. Once you have bought your ticket this allows you a full day pass to get on and off at any of the bus stops along the way, these are usually located at popular locations so you can spend time exploring. The tour takes around 1 hour 45mins and although the circuit doesnt appear to be exactly the same every time, its still a great trip. Our tour was cut short and we had to change buses at Parque Central to continue with the tour. We’re heard the bus can stop at other points not on the map if the driver needs to do a bit of shopping or meets someone for a chat. It’s very casual in Cuba! The Habana Bus Tour is a cheap and affordable alternative to private taxis with a day-long ticket costing the same as a single fare. With unlimited riding it has proved very popular with visitors, allowing you to spend as much or as little time exploring by foot as you’re comfortable with, while still taking in all the major attractions. This is the cheapest way to see Havana and all the main sights if youre limited with time. For only $10 CUC its great value. Sit on the top for the best views, however its really hot in the sun. Circuit can change without notice, just relax and go with the flow! Buses run every 30 mins starting at 9am everyday.